What does it mean to compose sacred music between Late Romanticism and the 20th century. 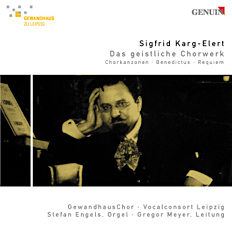 The Leipzig composer, Sigfrid Karg-Elert, gave a highly original and complex answer that is well worth a closer listen. Deep pathos and individual, almost intimate feeling are closely intertwined in the style of his teacher Max Reger. In the highly Romantic tonal language of his Kanzone “Näher, mein Gott, zu Dir” (“Nearer, my God, to Thee”), the chorale said to have been played by the ship’s band on the Titanic when it sank in 1912, Karg-Elert is likely to have worked through not only the death of his friend, one of the ship’s musicians, but also a catastrophe emblematic of the modern age. The GewandhausChor and Vocalconsort Leipzig have recorded all of this with fine attention to detail and at the highest level of artistic quality. Where forceful expression, introspection and festive sound stand so closely side by side there is only one thing you can say – Hosanna! "An outstanding recording from Leipzig!" Read the review in the Newsletter of the Karg Elert Archive!